Hemochromatosis is an inherited disease in which the body absorbs too much iron from the diet. Hemochromatosis is one of the most common genetic diseases in Canada affecting 1 in 327 Canadians. Normally, only enough iron to meet the body’s daily requirements is absorbed; the remainder is usually excreted through the bowels. In hemochromatosis, however, iron continues to be absorbed and stored in different organs and tissues long after body needs are met. The liver is the first organ to store iron and when its storage capacity is exhausted, the iron continues to accumulate in the heart, the pituitary gland and elsewhere in the body. If untreated, damage to the liver, heart, and pancreas may eventually lead to death. Hemochromatosis is hereditary. In order to have the disease, a patient must have inherited two defective genes, one from each parent. Siblings of an affected individual have a 25 percent chance of getting this disease. Children are less likely to be affected since the other parent must be a carrier of a hemochromatosis gene. How does hemochromatosis affect other organs? Iron accumulation in the heart muscle may produce irregular heart rhythm and heart failure causing shortness of breath and swelling of the ankles. When iron is deposited in the pituitary gland, it can lead to sexual dysfunction, loss of libido and impotence in men, and menstrual irregularities in women. Blood tests to measure the iron level in the blood and the total amount of iron deposited in the tissues are done to detect hemochromatosis. The most common tests are the transferrin saturation and serum ferritin. A new development is a genetic test for hemochromatosis. The test is usually done on a blood sample in a provincial regional lab specializing in DNA testing. The C282Y mutation of the hemochromatosis gene is present in greater than 90 percent of typical hemochromatosis patients. Additional diagnostic procedures may include a liver biopsy to determine if liver damage is present and to assess the amount of iron stored there. The genetic test has alleviated the need for liver biopsy in many young patients with hemochromatosis. As soon as a person is diagnosed as having hemochromatosis, the spouse, brothers, sisters, and children over the age of 18 should be checked. Screening is of greatest importance for siblings since they have a 25 percent chance of inheriting the defective genes from their parents. Genetic screening has allowed for the diagnosis at birth before iron overload has developed. It is probably ideal to test for hemochromatosis within families in teenagers rather than in very young children. The primary aim of treatment is to reduce the amount of iron stored in the body. This is accomplished by a procedure known as venesection or phlebotomy (bloodletting). It is usually done on a weekly basis and is similar to making a blood donation. Since the red blood cells contain iron, essential for transporting oxygen and nutrients to the tissues, the body will draw on the accumulated iron to replace the lost red blood cells. Treatment may take months, or even up to two or three years, depending on the amount of iron that has accumulated. Once the excess iron has been removed by blood-letting, the person must continue to have the amount of body iron monitored annually. No. However, iron supplements or multi-vitamins and mineral preparations containing iron should not be used. Also, vitamin C, which enhances the absorption of iron when consumed with food, should be avoided or only taken four hours before or after a meal. The consumption of excess alcohol should be avoided as it also enhances the absorption of iron. Can tissue damage be reversed? Injury to the liver is reversible provided treatment is started before cirrhosis (scarring of the liver) has developed. 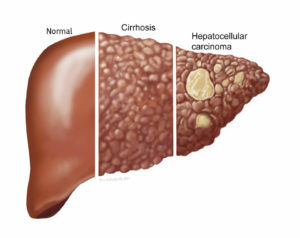 However, there is an increased risk of liver cancer in people with hemochromatosis who have cirrhosis. The early detection and treatment of hemochromatosis are crucial in preventing the complications of this potentially fatal disease.